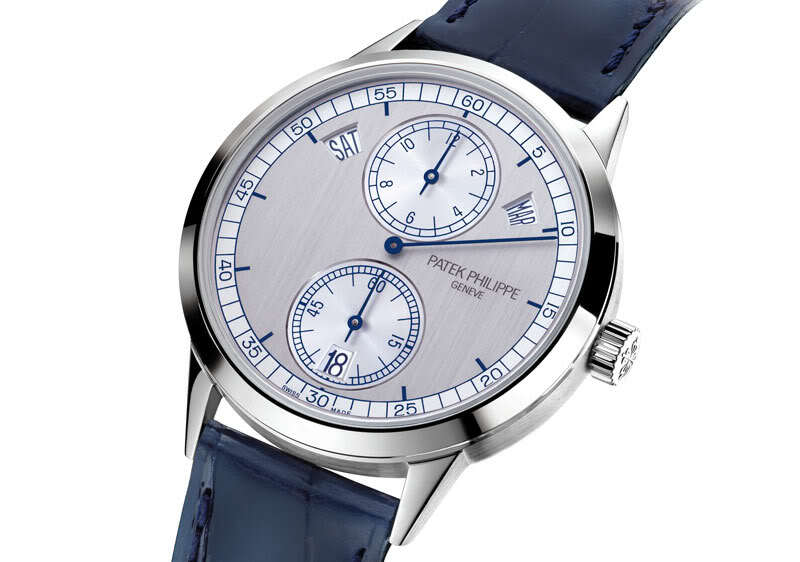 White gold and a blue "gradient" dial for a distinctive modern look! Blue dials have been popular for some time now. So much so, that they have almost become the rule instead of the exception. 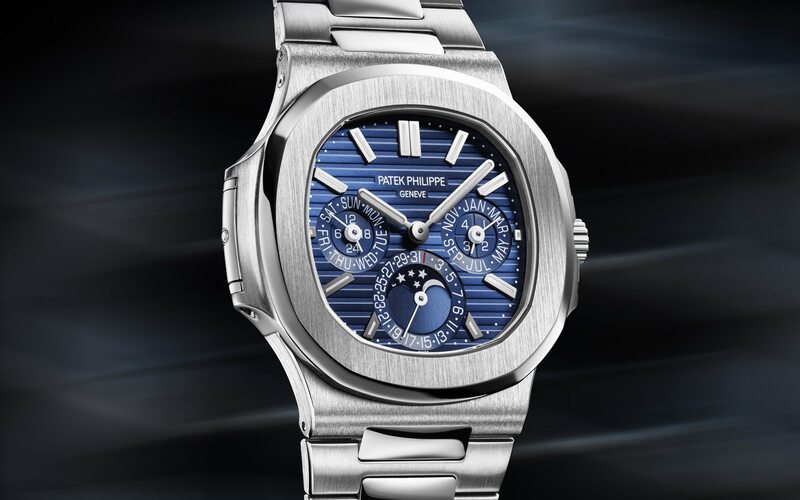 To stand out from the crowd with a blue dial nowadays, you are going to have to pull off something special. 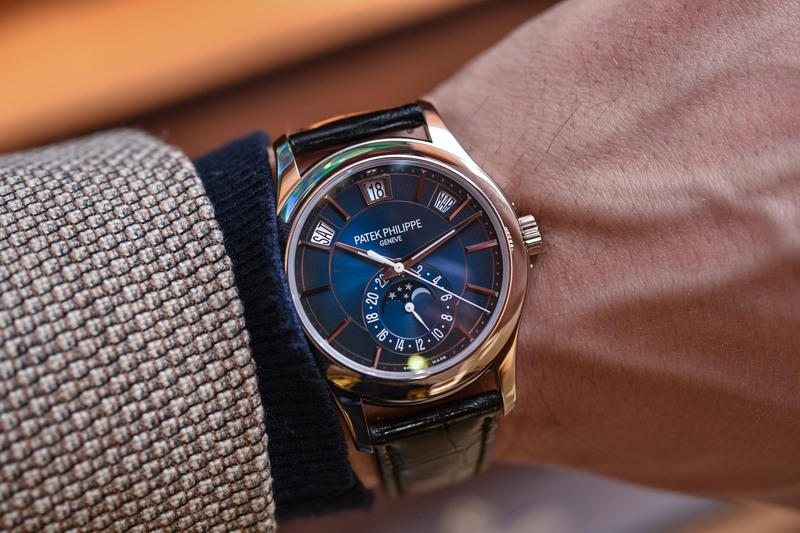 That’s exactly what Patek Philippe has done with the latest iteration of its reference 5205G. 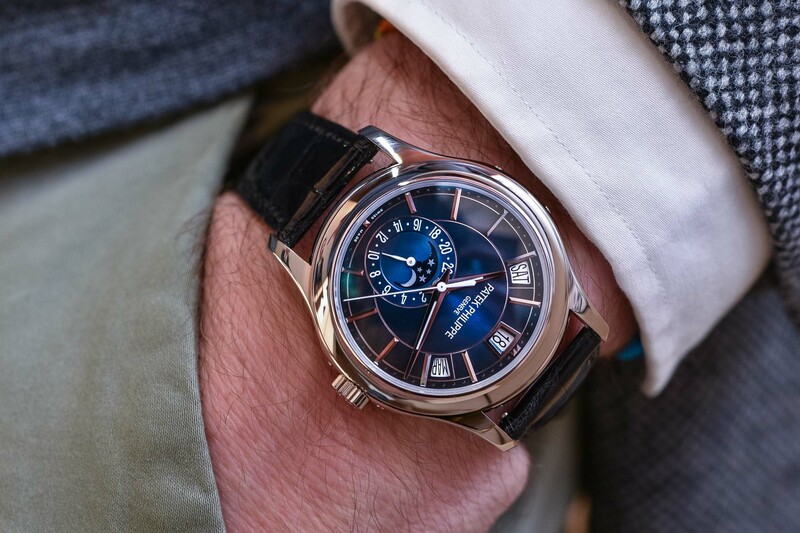 Although not a new watch per se, the addition of a mouth-wateringly delicious blue gradient dial has reinvented this model in my eyes, driving its desirability factor through the roof. 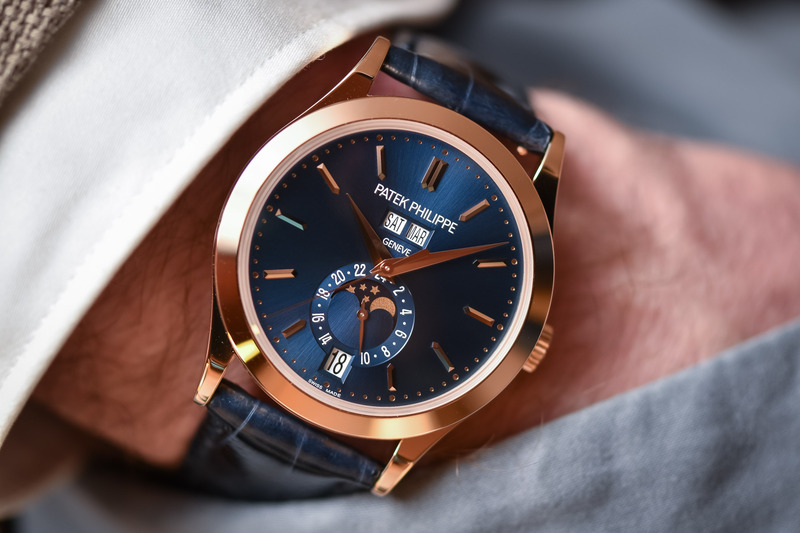 We spent some time hands-on with this watch recently, and let me tell you, the only thing harder than capturing the gorgeous blue tones was giving it back. 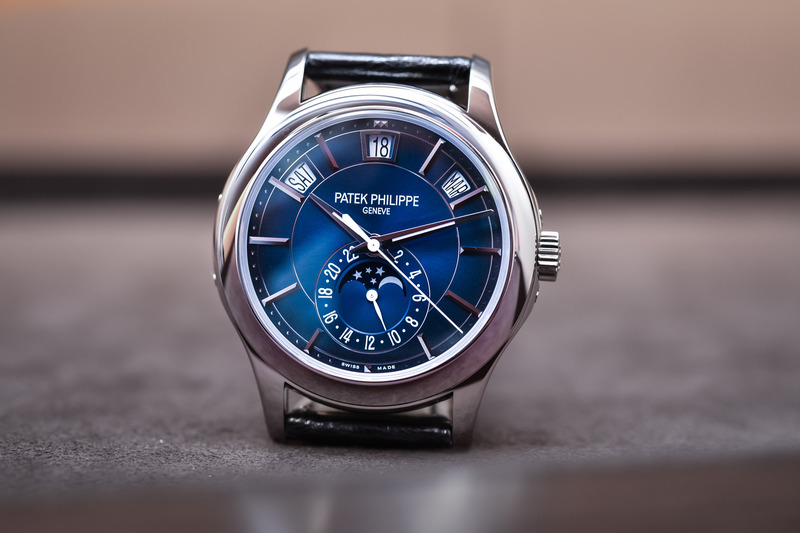 If you’re a watchmaking devotee, then you no doubt already know that Patek Philippe invented and patented the Annual Calendar complication back in 1996. More functional than a standard calendar, and more accessible than a perpetual calendar, it can automatically account for the difference in the number of days in each month (with the exception of February). 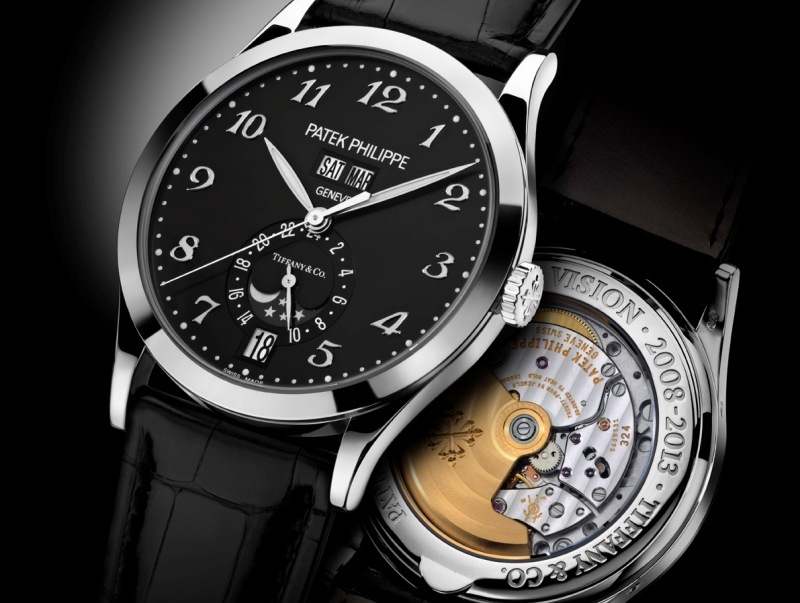 Patek Philippe currently offers three different Annual Calendar references for men; the 5146, the 5396 and the 5205. It is this last model, subject of our article today, that is arguably the most contemporary in its design. More about calendar watches in our dedicated technical article here. 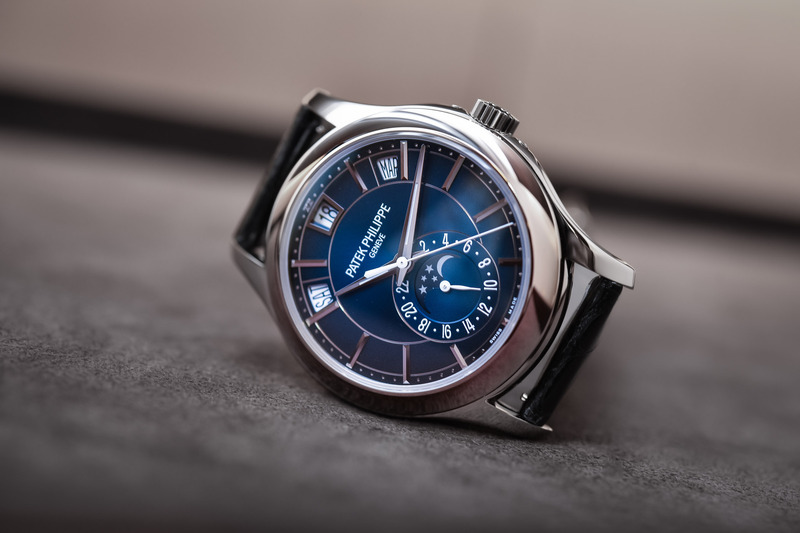 The layout will be instantly familiar to many, largely because this new 5205G replaces the existing white gold models that first introduced the series in 2010. Those models also had two-tone dials, but in much more muted grey and black variations. 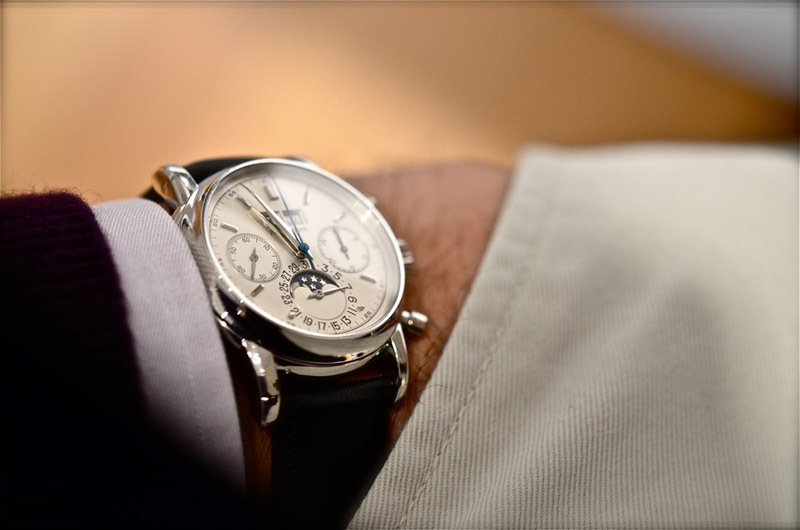 Day, date and month are displayed in an easy-to-read fashion across the top half of the dial via three distinct apertures – a display also found in the chronograph versions Ref. 5905 and Ref. 5960. The time is shown centrally via three hands with luminous coating, whilst a subsidiary dial at 6 o’clock houses a 24-hour indicator and the moon-phase display. All of this is presented in a beautifully shaped 40mm x 11.36mm case, crafted from white gold complete with slightly concave bezel and curved skeletonized lugs. Not only is it comfortable on the wrist, it’s also very eye-catching thanks to the addition of the new blue gradient dial. Let’s take a second to talk a bit more about this dial. I don’t want to sound like a hopeless fanboy wetting himself, but I have to say, it really is gorgeous. The blue sunburst pattern steadily radiates out to black and when the light hits it just right… Let’s put it this way, prior to this Ref 5205G-013, I would never have seen myself wearing a 5205 (if I should ever be so lucky to find myself in that position). 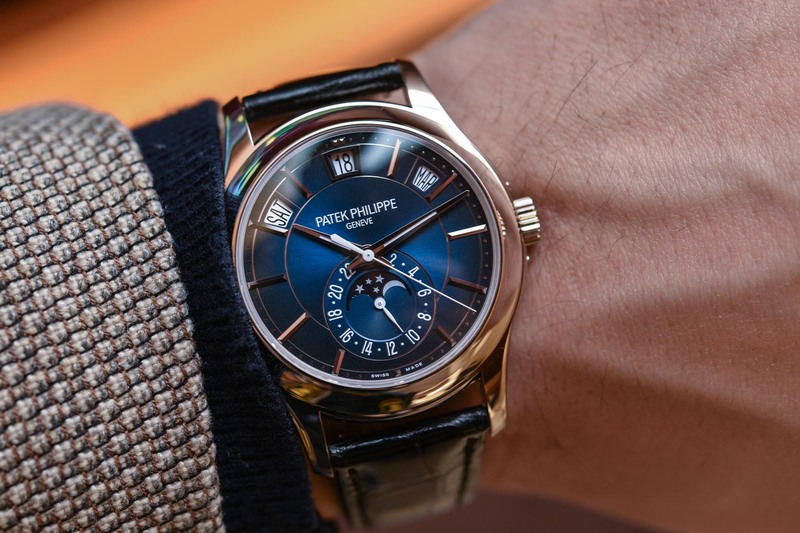 Don’t get me wrong, the rose gold models are nice but feel a little bit more ‘traditional’ to me. The 5205G, however, is young and contemporary and, for want of a better word, cool. Inside is the self-winding Calibre 324 S QA LU 24H/206. 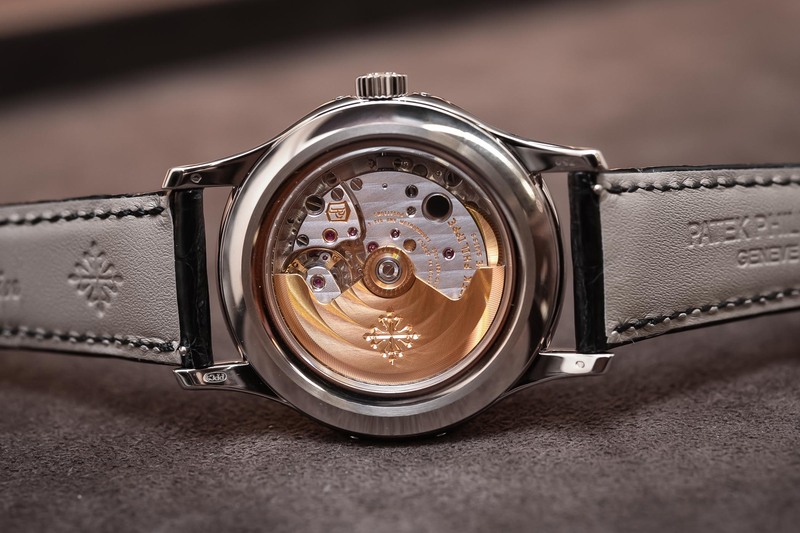 Comprised of 356 parts, it features Patek Philippe’s patented Gyromax balance and Spiromax balance spring. Visible through the sapphire caseback, its central rotor is crafted from 21k yellow gold. Oscillating at 28,000vph, it offers a maximum power reserve of 45 hours (a tad short, as often with PP.) 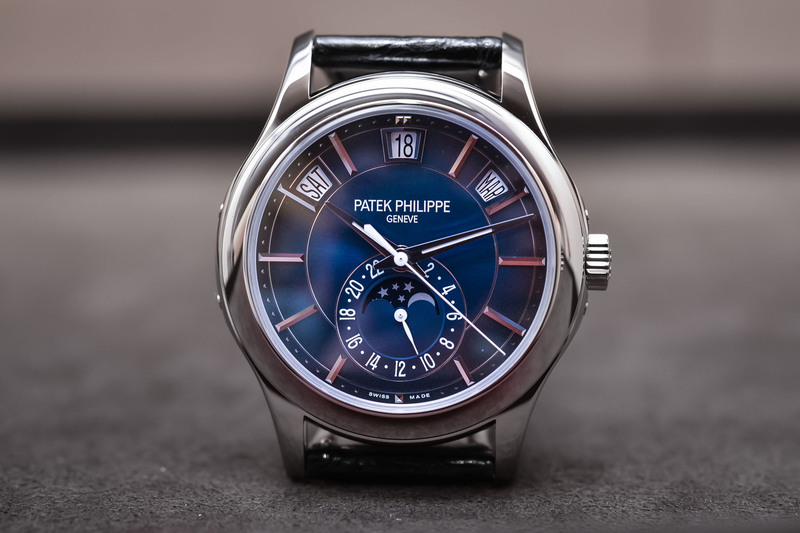 Finishing is to the brand’s exacting standards, which is why this movement is adorned with the Patek Philippe Seal. The new Ref 5205G is worn on a shiny black hand-stitched alligator strap with square scales and a white gold prong buckle. Perfect for dressing up or down (relatively speaking), this stylish model has already proven to be a hit with the new (read: younger) generation of watch aficionados. Available now, pricing is set at EUR 43,520. 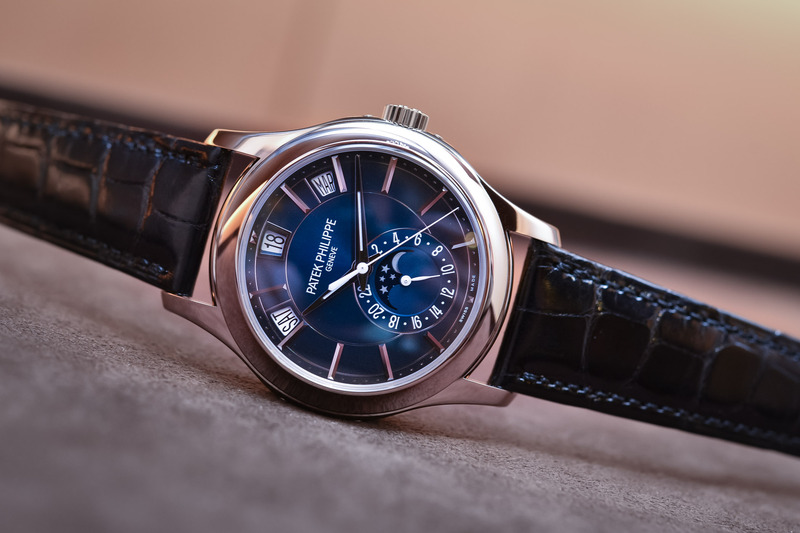 More details on patek.com. Nice watch but too much expensive..